Pes cavus (claw foot) is a genetic condition that causes a high arch, giving the foot a claw-like appearance. This often leads to tight calf muscles and pain in the forefoot. People with claw foot have difficulty finding shoes that fit properly, which can lead to other foot conditions. This condition is the opposite of flat feet but is much less common. Pes cavus is a condition in which there is exaggerated height of the longitudinal arch, which means that the foot is fairly inflexible due to tight calf muscles. This foot positioning puts additional stress on the metatarsal heads. The calf tendon is stretched over the heel and into the arch and the raised arch puts additional stress on the calf muscles. Those people with this genetic disorder must work to correct it or work around it in their activities. Genetic condition. Possibly secondary to contractures or disturbed balance of the muscles. Pain in the foot, especially when walking or running. Toes may be bent. If left unattended, pes cavus can lead to chronic pain and possible injury to other structures in the foot. Foot instability is common, and could lead to strains and sprains. Stretch the calf muscles and the foot. Stretching the calf muscles and the foot is the fist and most important step in rehabilitation. Finding proper fitting shoes will be important as well, which will help support the arch but also prevent injury due to the instability of the foot. Strengthening the muscles of the lower leg will also support the foot. If surgery is required, it will be important to increase strength and flexibility in the muscles that are immobilised. When treated properly, claw foot can be corrected and the symptoms relieved. Surgery may be an option, especially when pain is severe and other treatments do not help. Call (+65) 64712 674 (24 Hour) to make an appointment to treat claw foot today. This patient has bunion to her both feet. Correction of bunion is done to her left foot. The hallux valgus (Bunion) is the most common foot deformity. Bunions are bony protrusions on the inside of the big toe and are a common source of pain and difficulty and wearing shoes. 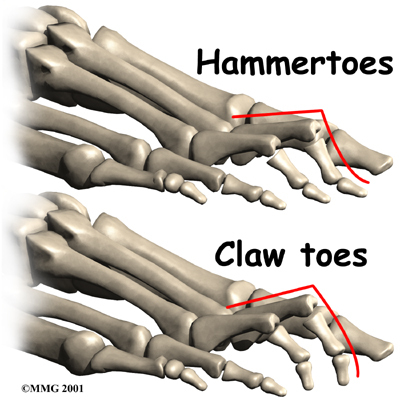 They are commonly associated with deformities of the other toes, such as Hammer toes and Claw toes. The main underlying problem is the protrusion of the “knuckle bone” (Metatarsal bone) of the foot. These forefoot deformities can also cause painful corns under the ball of feet, or along the sides of the feet at the Bunions, and occasionally at the 5th toe (also known as Bunionette Deformity). Another common association is that of flat feet, and tight calf muscles. Many people live with these problems by wearing broader extra width shoes or open sandals but the more severe and problematic feet often need surgery. However, foot surgery has traditionally always been associated with long down times and this has deterred many patients from surgery. Fortunately, new techniques and concepts in surgical management have shortened down times by as much as 90%. Traditional techiniques been using Distal Osteotomies (e.g. Mitchell or Chevron Osteotomies ) for the milder bunions. An Osteotomy is a cut made in a bone to correct deformities. These are relatively simple procedures. However, they are not able to correct the more severe deformities. The more severe deformities require proximal Metatarsal osteotomies or fusions (Lapidus procedure). The Scarf Osteotomy is a hybrid procedure which has the best of both worlds. It is able to correct very large deformities and yet has the shortest down time of all. The term “scarf” comes from carpentry and the nature of the scarf cut is that is it more stable, allowing for quicker recovery and earlier weight bearing. With the aid of a special walking shoe, the patient is able to walk immediately with minimal pain soon after the surgery. By about four weeks, most patients are walking reasonably well. Return to sports can be made possible in as early as three months. Call +65 6471 2674 to see our orthopaedic specialist regarding your bunion today.